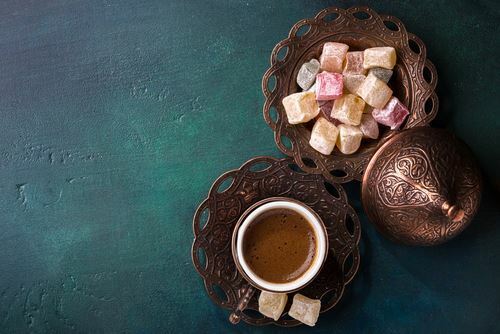 The sweetest member of Turkish cuisine, the best gift to give, the best companion with coffee, a nostalgia from childhood, a reason to love holidays; yes, you are right! We are talking about Turkish lokum. Here you are the facts you should know about lokum which dates back hundreds of years and is an important part of the Ottoman cuisine. The Turkish delight which was an important part of the palace cuisine in the Ottoman period, has hundreds of years of history. The sweet 'abhisa', which was frequently consumed by the Sassanites who ruled in the Persian Empire between 226 and 652 BC, although not certain but is known as root of Turkish delight. Lokum was first referred to as ‘rahat ul-hulküm’ in Arabic which means ‘comforting the throat’, but over time it became ‘comfortable delight’. And finally, it was called ‘lokum’ in modern Turkish. Its recognition in the Anatolia began from the 15th century. It became the most popular in the 17th century. In the 18th century, the travelers took lokum to Europe and introduced it as 'Turkish Delight'. Lokum also gained popularity here. Mass production in the Ottoman Empire began in 1777. At first it was mixed with honey, fruit syrup and flour. With the invention of starch and refined sugar, the flavor has changed until today. How is Turkish Delight Made? Lokum is made with citric acid, sugar, starch, food color and aroma. Sugar is boiled in water until it is fully dissolved. The citric acid and starch are left to dissolve in separate cups. Then citric acid and starch are mixed with sugar water. It is boiled for a while. The mixture is checked with a spoon whether it is in a sticky consistency, and it is kept in starchy cups for 20 hours. As a final step, it is shaped on rigid floor and packaged. There are many kinds of lokum according to taste, production style and production place. 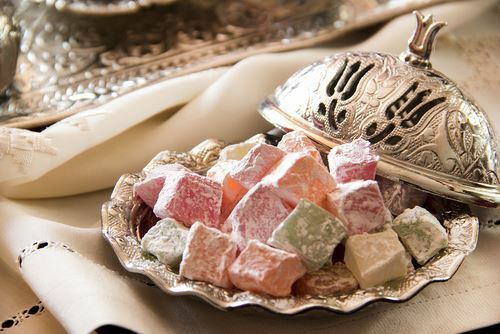 Here are some of the Turkish delight varieties: Kuş lokum, hazelnut lokum, walnut lokum, double roasted lokum, pistachio lokum, coconut turkish lokum, creamy lokum, fruity mini turkish lokum, lemon lokum, mint lokum, pomegranate lokum, pistachio croquant Turkish delight lokum, pomegranate with pistachio lokum, saffron with pomegranate lokum, atom lokum, rose petal with pomegranate and pistachio lokum and chocolate lokum. According to the ingredient used, the nutritional values change and mean values are determined. In a 100 gr of lokum: 89.28 gr carbohydrate, 0.12 gr protein, 0.19 gr fat, 0 gr fiber, 0 mg cholesterol, 19 mg potassium, 5 mg calcium and 0.1 mg iron is present. Its carbohydrates are useful for kidney diseases. A wonderful healer for boils and sores. Food and sweets in the Turkish cuisine have multiple forms of presentation. This also applies to lokum. As well as being served in a handkerchief, lokum is also served along with plain, medium or sweet Turkish coffee. Too much lokum, is it harmful? Just as anything too much lokum is harmful. Lokum which is a healthy and natural food contains carbohydrates, starch and sugar. Excess consumption of lokum may cause indigestion of these components, resulting in the liver oil. This means weight gain. Therefore, lokum should not be consumed excessively.